Motor sport fans poured into Thruxton in their droves last weekend (9/10 May), as the Dunlop MSA British Touring Car Championship made its annual visit to the fastest circuit in the country and spectators and competitors alike felt the benefits of the venue’s recent raft of improvements. 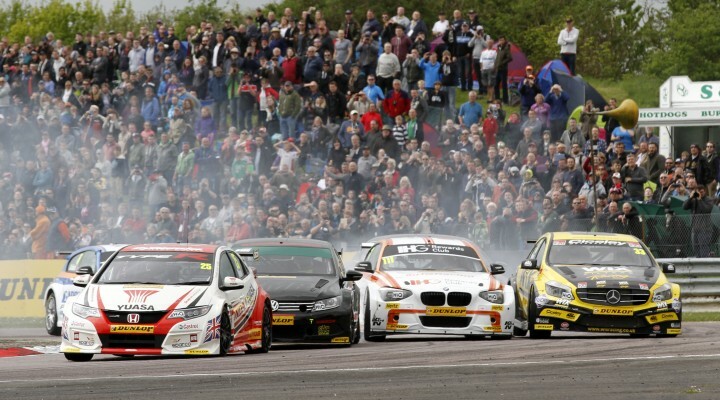 The BTCC is traditionally one of the biggest and busiest events on Thruxton’s calendar, and the 2015 edition was no different, as hordes of motor sport aficionados and interested locals descended upon the popular, high-speed Hampshire track. Over the off-season, much work took place to further enhance the safety of the flat-out right-hander at Church – the fastest and most demanding corner in Britain – via the first phase in a series of run-off and barrier alterations. Spectators also enjoyed better core facilities than ever before, including more hard-standing areas and stoned walkways and an improved PA system. Thousands of fans were able to lap up all the excitement as the likes of Gordon Shedden, Jason Plato, Adam Morgan, Matt Neal and hometown hero Rob Collard went wheel-to-wheel and doorhandle-to-doorhandle around Thruxton’s famous sweeping curves. “What a brilliant event!” enthused Thruxton Group Managing Director Bill Coombs. “We were delighted to see so many people coming through the gates on both days, and we received a lot of positive feedback from both competitors and fans. “We were particularly pleased to hear drivers’ enthusiastic comments regarding the changes made to Church, and whilst we’re aware that there remains work to do as part of our multi-year plan, it was encouraging to see that the steps forward that we have made across the board are taking us in the right direction.